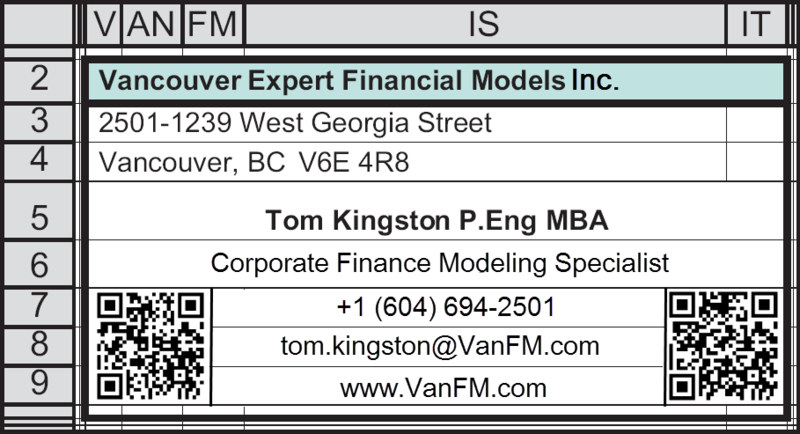 Tom Kingston P.Eng MBA is Corporate Finance Modeling Specialist/Owner of Vancouver Expert Financial Models Inc. With over fifteen years experience in finance and often dealing directly with CEO's and CFO's, Tom has built financial models and provided consulting advice to companies in a wide range of industries including Vitaeris Pharmaceuticals, Sun Microsystems, BC Ambulance Service, Chinook Scaffold Systems, Aspreva Pharmaceuticals, The Loewen Group, Money Mart, Run of River Power, Abercrombie & Kent, Intrawest, PhotoChannel Networks, Red Robin Restaurants, AMEC, and Lions Gate Metals. These financial models spanned the full spectrum of complexity from the simple (budgeting templates, cash flow forecasts) to the more advanced (FS forecasts, NPV, IRR) to the complex (monte carlo simulations, macros, solver optimizations). Tom also has ten years of operations experience including six years as a front-line maintenance supervisor and two years as maintenance engineer with Repap Miramichi, and two years as an area engineer with Fletcher Challenge Canada. Tom Kingston holds a Bachelor of Engineering Science (Mechanical, 1988) from Western University in London and a MBA for Science and Technology (Finance, 1997) from Queen's University at Kingston. In addition, Tom has a certificate of completion of the Canadian Securities Course (Honours, 1994) and is a registered professional engineer with the Association of Professional Engineers and Geoscientists of British Columbia. Copyright 2018 Vancouver Expert Financial Models Inc.